Ukraine is undergoing major reform of the collective management sphere, which raises numerous questions about the activities of the SO «UACRR». The State Organization “Ukrainian Agency for Copyright and Related Rights” announces the continuation of its activities and the preservation of all the rights of authors and copyright holders management functions until the completion of long and rather complicated reforms in the field of copyright . On July 22, 2018, the Law of Ukraine “On Effective Management of the Rights of Owners in the Field of Copyright and(or) Related Rights” (hereinafter – the Law) entered into force, which launched the reform. This law provides a new procedure of registration of collective management organizations, and using copyright and related rights objects for the collection of reward(deductions) in some areas, provided the activities of specially accredited collective management organizations. – public announcement of musical non-dramatic works with and without text, including those works included in audiovisual works, in addition to cable retransmission. Paragraph 2 of Section VI “Final and Transitional Provisions” of the Law provides that the certificates of registration of collective management organizations issued to this Law shall expire nine months from the date of entry into force of this Law, that is, from 22.04.2019. However, in order to prevent chaos in the field of collective management and to protect the rights of authors, composers, performers, music publishers, etc., the legislator in paragraphs 2-3 of Section VI “Final and Transitional Provisions” of the Law provided a transitional period when on the one hand training to the accreditation of collective management organizations takes place, and, on the other hand, the SO «UACRR» remains an active collective management organization and continues to perform its functions. The separate provisions of the Law are devoted to issue of reforming the SO «UACRR», as the largest and most respected organization of collective management in Ukraine. Thus, part 4 of Section VI “Final and Transitional Provisions” of the Law provides the deadline “to bring collective management of property rights carried out by SO «UACRR» in accordance with the requirements of this Law” – not 9, but 14 months from the date of entry into force of the Law, that is 22.09.2019. 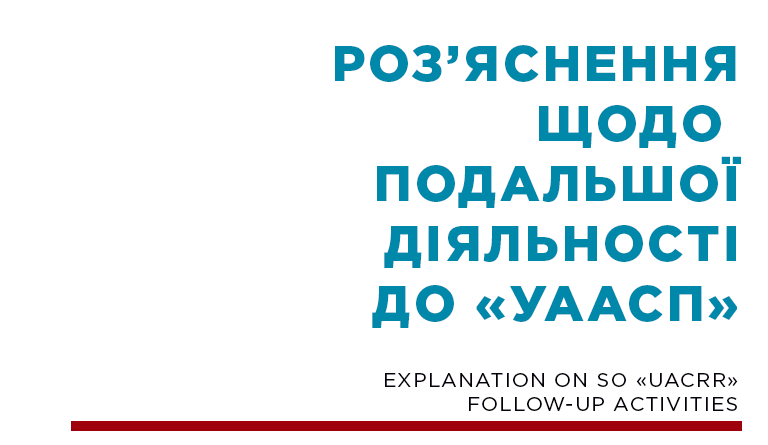 At present, the leadership of the SO «UACRR», together with the author’s community of Ukraine and specialists of the Ministry of Economic Development and Trade, are taking effective measures within the framework of reforming the activity of our organization. At the same time, SO «UACRR» continues to fulfill all its obligations both to the authors of Ukraine and the rest of the world, as well as to numerous partners who uses the objects of copyright in their activities. We appeal to the owners of catering establishments, entertaining establishments, TV and radio organizations, providers and organizers of touring and entertainment events. Do not allow chaos in the field of copyright, do not succumb to provocative calls. Despite the complexity of the reform, the SO «UACRR» will always stand for the protection of copyright in Ukraine and the interests of its partners.